Ms. Pia Silvani (bio) being interviewed by Dr. Suzanne Hetts. Dog aggressive dogs are disturbing and embarrassing for owners. People find it difficult to take these dogs out in public for fear of encountering another dog. Consequently, many of these dogs are socially isolated from other dogs for the rest of their lives, their quality of life decreases and some are surrendered to shelters or euthanized. What can be done to help these dogs and to control and mange them in class? Can these dogs be re-introduced into the canine community or even safely taken for walks without a fight occurring? Are so-called growl or feisty fido classes the answer? What do these classes involve, and what should trainers and owners know before considering them? 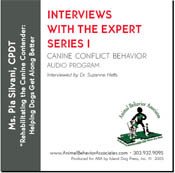 Hear Pia’s answers to these questions and more, based on her years of experience instructing Feisty Fido classes at St. Hubert’s Dog Training School, in Madison NJ, where she is also the Director. If you purchase the MP3 audio, you will instantly be sent links to this great audio interview to play on your computer or other mp3 player. Will play on most home computer systems using Windows Media Player, QuickTime Player, Real, or similar audio player. Audio products are copyright protected and may not be copied without express written permission.